Roofing requires a lot of energy and hard work — and a large disposal solution. 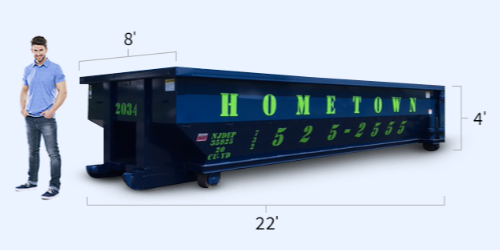 Whether you’re a homeowner or a roofing contractor, you’ll find affordable dumpster rentals for roofing at Hometown Waste. When you have the right dumper rental for your roofing job, the work moves far more efficiently, since disposing of old shingles and other roofing materials is easy and convenient. Are you about to start a significant roofing job? You’ll need a roofing dumpster that can hold tiles, wood shingles, asphalt shingles, wood, gravel, flashing, trim, underlay, felt paper and all the other roofing materials you remove. Make sure you have the ideal New Jersey roofing dumpster when you choose Hometown Waste. Best Use: Small-scale roofing jobs for sheds or small garages. Note: Be sure not to overfill your dumpster. A roofing dumpster can be only half full and be overweight. It depends on the density of materials. Best Use: Mid-size roofing jobs such as a garage roof or pavilion. Best Use: Roofing jobs for small to mid-size houses. Best Use: Roofing jobs for large houses or commercial jobs. 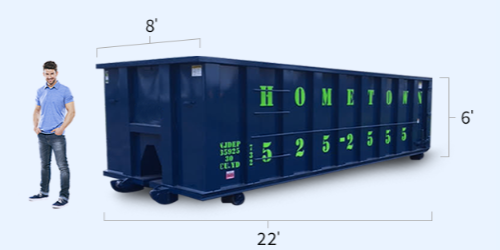 What Size Dumpster Do You Need for Roofing? How many “squares” (not square feet) is the roof? How many “layers” of roofing is on the roof? Are the shingles three-tab or architectural? Generally speaking, 1 square (which is 100 square feet), or about 3 bundles of 3-tab shingles, weighs ~260lbs. An average roof is about 30 squares, so this means you would need 90 bundles of shingles to cover the roof. With this knowledge, if you are aware of how many layers the roof is, you can do the math to know the approximate weight of your dumpster at the end of a roofing job. Note that architectural shingles are layered so they weigh more and take up more space in a dumpster. Generally speaking, architectural shingles weigh ~400lbs/square. **THIS IS SOLELY BASED ON ESTIMATES AND EACH SQUARE WEIGHING APPROXIMATELY 260LBS. THIS DOES NOT INCLUDE ANY SCRAPS, PLYWOOD OR OTHER MATERIAL THAT MAY BE THROWN AWAY IN THE DUMPSTER. Example: if you have a roof that is 25 squares and 2 layers – your roof, in fact, is a 50 square job because it has 25 squares each layer. 50 square (of 3 tab shingles) x 260lbs = 13,000lbs. 13,000lbs/2000lbs(1ton)= 6.5tons. “Wow,” some may say. It is important to know that roofs hold a significant task in keeping your household dry and it cannot be taken lightly. Roofing shingles are one of the heavier items that are commonly disposed of in roll-off dumpsters. If you are not able to obtain or weren’t informed of how many “squares” or “layers” your roof is, you can still figure the math out one other way. If you can find out how many “bundles” of shingles the contractor purchased for the job, you can simply divide that number by 3. 3 bundles of shingles is equivalent to 1 square of roofing. Then simply follow the math above. Important note: Just because a roof is 1 or 2 layers doesn’t always mean that’s what’s on them when the roof gets ripped off. As roofs age, people tend to patch leaks and add layers to the preexisting layers. When the time finally does come that you cannot add on to the preexisting roof and it is time to do a full replacement, the old roof may weigh much more than the new roof going on. That is just another reason why the math we do above is just an approximation to steer you in the right direction. Roofing budgets should always have room for unexpected expenses as it’s hard to know what’s entailed until the job is in progress. As a direct company, Hometown Waste has first-hand experience with dumpster rentals for roofing jobs. Driveways and properties are always a concern when renting a dumpster. It is important to load the dumpster evenly when it comes to roofing shingles because they are so heavy. Roofing shingles are thin and flat and more often than not do not take up the entire space of the dumpster. If all the roofing shingles are placed in a pile instead of evenly distributed throughout the dumpster, you are unevenly distributing the weigh in the dumpster. Underneath the dumpster are 4 wheels, if all the weight is pressing on to one side of the dumpster, you may experience a result where the wheels press like a stamp leaving an imprint behind. Nobody wants this! While it’s not a guarantee that evenly distributing the weight will prevent this, it is a lot less likely to happen. At the request of the customer, Hometown Waste can provide wood to be placed under the dumpster to serve as a buffer. While this may provide adequate support, the best recommendation when doing a roof job is for the homeowner or contractor to provide (2) 4×8 sheets of 1/2in thick plywood. 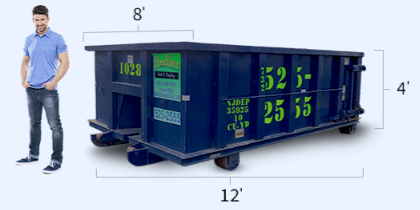 Plywood is inexpensive and the best solution to avoid marking property because the entire dumpster sits on wood and evenly distributes the weight of the dumpster. Plywood can be picked up at your local hardware store (Lowe’s, Home Depot, Etc.). You simply place the plywood in the drop location and Hometown Waste will take care of the rest. Do you have unwanted items in your home? Throw them away with your dumpster rental. Kill two birds with one stone. Unfortunately, roofing shingles are not a recyclable, therefore, if you would like to utilize the rental for more than just your roof job, with Hometown Waste, you can! Let’s be honest – how many more times do you expect to see a dumpster in your driveway? 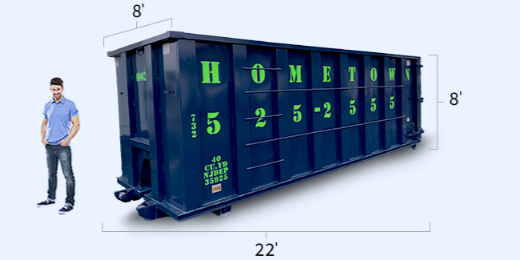 A dumpster rental is an investment and we encourage you get your money’s worth.